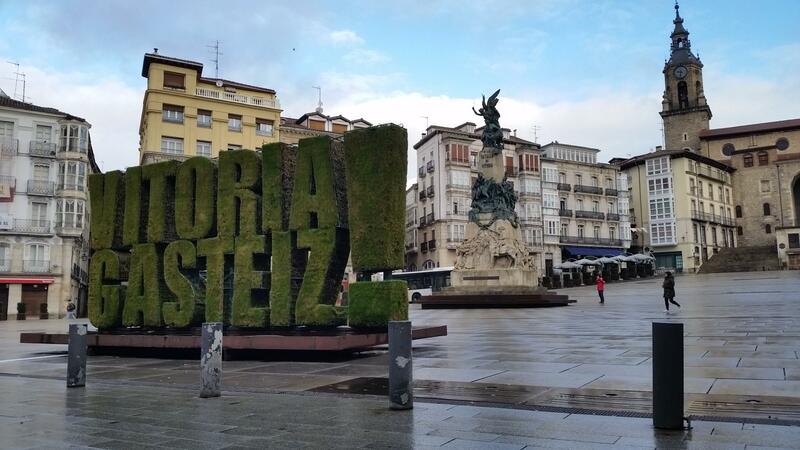 Last month we were invited to attend the International Sustainable Tourism Summit organized by the Instituto de Turismo Responsable (ITR), the Global Sustainable Tourism Council (GSTC) and the Basque Tourism Authority (Basquetour), held in the region’s capital city of Vitoria-Gasteiz. The event attracted over 200 inspiring (and aspiring) sustainable tourism professionals mostly from the Basque Country, Catalonia and the Canary Islands, while at the same time it had a distinctly international feel thanks to the participation of experts representing TUI, UNEP, UNESCO, UNWTO and many other leading organizations working towards a more sustainable travel and tourism industry. Official conference highlight was the signing of the Sustainable Tourism Charter, a declaration of intent by the conference attendants to promote a more sustainable and responsible tourism. Back in 1995, environmental and tourism organizations came together on the island of Lanzarote (Spain) to sign the Charter for Sustainable Tourism, under the auspices of UNESCO, the World Tourism Organization (UNWTO), the United Nations Environment Programme (UNEP), the World Heritage Centre, the European Commission and the United Nations Division for Sustainable Development. The conference saw the birth of the term and the concept of Sustainable Tourism, which, along with the Declaration, was a significant shift in the tourism industry and the carrying out of tourism towards more responsible ways of conducting and conceiving this activity. 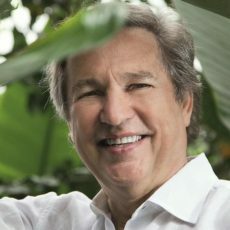 Twenty years later, travel and tourism activities have grown considerably – in some places dramatically – leaving the industry’s leaders and key stakeholders charged with the challenging task of finding ways to ensure future travellers will be able to enjoy pristine natural environments and authentic cultural experiences. 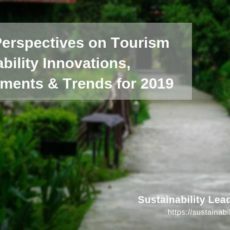 Despite dozens of high-level initiatives aimed at promoting sustainability in tourism – including the creation of the Global Sustainable Tourism Council as watchdog over a confusing number of eco-certifications – travel and tourism as a whole lags behind where in the environmental and social arena. While some regions, such as Europe, are doing comparatively well, other parts of the world – especially Asia – experience rapid growth, both domestically and internationally. Moreover, tourism hasn’t yet been able to attract sufficient interest in international sustainable development discourse (we recommend the guest post by Steve Noakes on the new UN sustainable development goals and their implications for tourism). 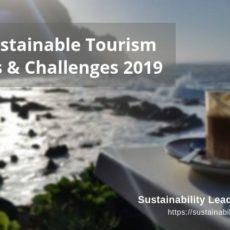 Initiatives such as the World Charter for Sustainable Tourism (ST+20) are key to bring together the main actors in sustainable tourism, to facilitate networking between representatives of NGOs, destinations, businesses and communicators. ST+20 as symbolic action reminds us that collaboration on the environmental and social front is inevitable for being able to offer enjoyable, quality travel experiences. Those expressions of intent now need to be translated into legally binding commitments. In other words, the +ST20 journey has just begun. Miguel Angel Troitiño Vinuesa, Professor at Universidad Complutense de Madrid, expressed concern that the tourism industry is not sufficiently represented in international organizations and institutions. Helena Rey (UNEP) stressed the importance of collaboration between the different tourism stakeholders – companies, local communities, ministries – who need to work together in order to develop and execute a shared sustainable tourism vision. Karmen Mentil of Alpine Pearls impressed her audience with this innovative marketing and sustainability cooperation between destinations across countries, and made us smile at the thought of German tourists voluntarily handing over the keys of their comfortable cars in order to enjoy some healthy, car-free holidays in the European Alps. Various speakers mentioned the importance of education as key element for sustainable tourism, and as means to promote peace and well-being. 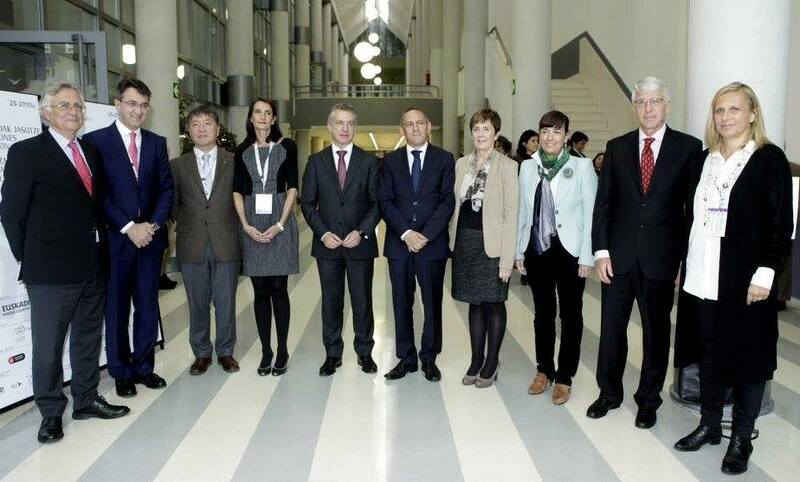 Organizers and keynote speakers of the Sustainable Tourism Summit, with Tomás Azcárate, President of the Responsible Tourism Institute (first on the left), and the Basque Lehendakari Iñigo Urkullu (fifth on the left). Hebert Hamele, founder of the European Network for Sustainable Tourism ECOTRANS, urged those present to make use of the information and tools already available – no need ‘to reinvent the wheel’. One of his latest projects within the network DestiNet are the Green Travel Maps, aimed at helping tourism marketing organizations. Cipriano Marín, Secretary General of the first International Conference on Sustainable Tourism (1995 in Lanzarote) and coordinator of the Biosphere Smart initiative, emphasized that every destination is different and needs indicators which are adapted to its specific requirements and accessible to all stakeholders. 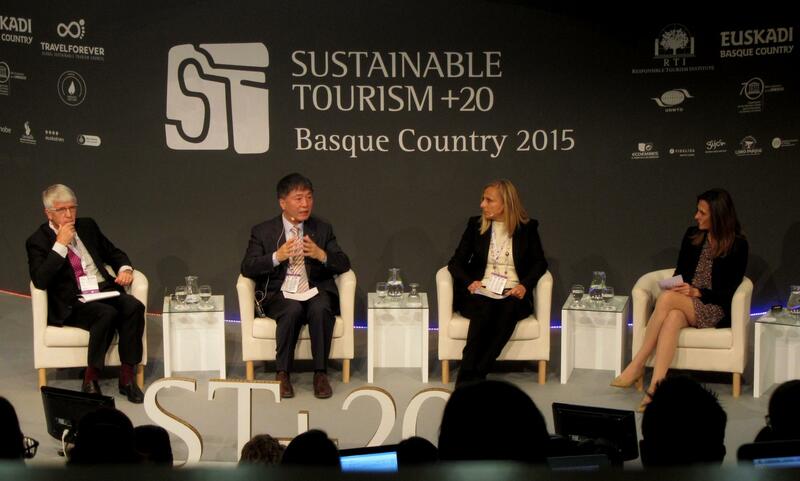 More about the Sustainable Tourism Charter here.